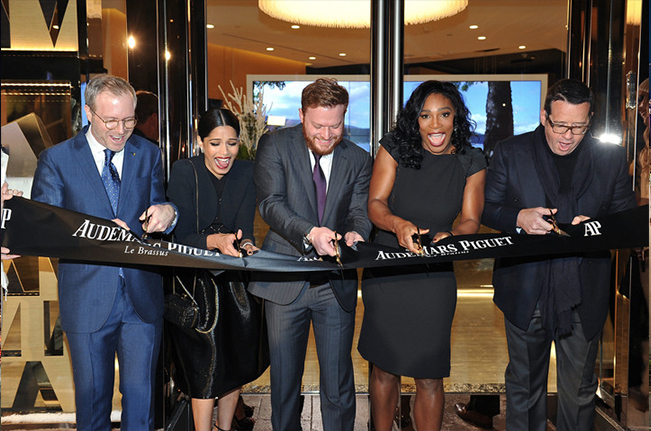 Audemars Piguet held a Grand Opening Event to celebrate its fourth U.S. boutique, located at Two Rodeo Drive. The event paid homage to its Swiss roots with a winter wonderland theme, complete with snow confetti, fire pits, custom Swiss chalets, all while being served hors d’oeuvres by servers outfitted in stylish Chalet winterwear. In attendance were Sylvester Stallone, Kevin Hart, John Mayer, Don Cheadle, Serena Williams, Freida Pinto and many more.